The typical assignment in most higher education mathematics classrooms is problem sets — but that’s changing, according to attendees of the Mathematical Association of America’s MathFest 2016, held last week in Columbus, Ohio. Leaders in the math community realize their graduates need to know how to write, either to explain mathematical concepts for the general public or for their careers outside of the discipline. Wiki Education Foundation staff were at the conference to showcase how Wikipedia assignments can meet those needs, while also providing students a meaningful service learning opportunity. 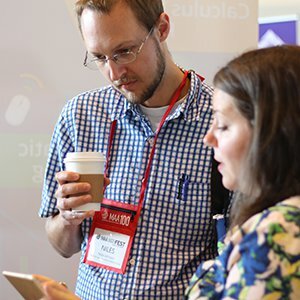 Educational Partnerships Manager Jami Mathewson shows an interested instructor our Dashboard course management software at MathFest 2016. “That sounds amazing. I’m all for it!” an excited instructor told us. Another professor lauded the “authentic task” of writing for Wikipedia as a class assignment. Wiki Ed’s Year of Science initiative is aimed at improving Wikipedia’s coverage of STEM and social science topics, while giving students those authentic learning experiences that teach them important skills like writing, research, critical thinking, and collaboration. Several MathFest attendees were excited to participate in our program to improve Wikipedia’s coverage of math topics as part of the Year of Science. Not only were instructors at the conference interested in improving articles on course related topics, they also expressed desire to see their students expand coverage of mathematicians on Wikipedia. Many instructors also noted that the math coverage on Wikipedia is highly complex, and some of their students in introductory courses struggle to understand Wikipedia’s math articles, even though the articles should be accessible to a general audience; they were interested in asking advanced students to re-write lead sections to make the articles more accessible to the public. We look forward to seeing many of the instructors we met at MathFest teach with Wikipedia this fall or in future terms. To learn how you can join our program, visit our website, or email us at contact@wikiedu.org.